Army ROTC will give you valuable real-world tools and leadership skills that will benefit not only your professional career but your personal life as well. Army ROTC is an elective curriculum you take along with your required college classes. It prepares you with the tools, training and experiences that will help you succeed in any competitive environment. Along with great leadership training, Army ROTC can pay for your college tuition, too. You will have a normal college student experience like everyone else on campus, but when you graduate, you will be an Officer in the Army. Being an Officer in the U.S. Army means you’re a leader, a counselor, a strategist and a motivator. It’s similar to being a vital manager in a corporation. As an Officer, you will lead other Soldiers in all situations and adjust in environments that are always changing. You’ll be driven to achieve success with your team on every mission. Army ROTC is a one-of-a-kind experience. The challenges you face and the obstacles you’ll overcome will prepare you for future success. 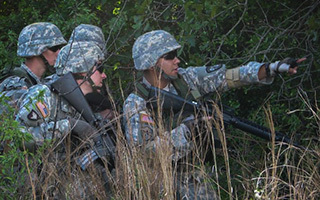 Army ROTC is one of the nation’s top leadership programs, with many benefits to joining.